Are you worried that your family might be exposed to lead-based paint or lead dust in your home? 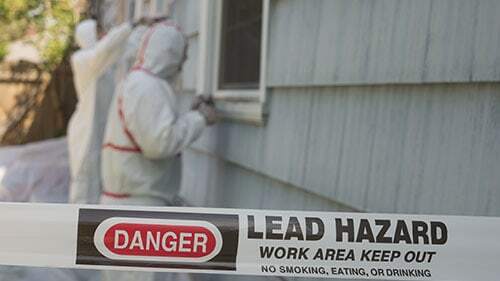 Major lead problems arise from older homes as the interior and exterior walls, doors, and windows may have been painted with lead-based paint products. However, in 1978, the US federal government banned the manufacturing, selling, and use of lead-based paints in residential properties. That said, there are still more than 24 million homes in America that have elevated levels of lead dust and peeling lead-based paint. Rosenfeld Injury Lawyers LLC represents victims of injuries caused by the negligence of others. Our law firm has successfully prosecuted cases for our clients who suffered serious side effects of lead-based products including paint, gasoline, toys, and other goods or building materials that contain the toxic substance. Our attorneys are available to answer any legal questions on how to receive the monetary compensation you deserve if your injuries were a result of someone else's negligence. Should you have additional questions, we invite you to contact our office for a free review of your legal rights. Toxic levels of lead can quickly build up in the bloodstream, especially in younger children. Lead poisoning usually develops over months or years and first displays its serious side effects through a physical or mental impairment. Young children are most at risk for lead poisoning if they put lead-containing peeling paint, objects, toys, or other products in their mouths. The transfer of contaminated dust can easily occur when fingers are placed on the object and then into the mouth. Children are most susceptible to suffering irreversible damage to the nervous system and brain cells. Families and individuals who live and older houses, especially those that were constructed before 1978. Individuals who live around areas that could contain contaminated soil including artificial sports fields, smelter facilities, and the land around construction industries and auto repair companies. The nurse will use an alcohol swab to clean the area where the blood sample will be taken. The antiseptic swab is used to minimize the risk of infection. After tying an elastic band around the upper arm that helps plump up a vein, the nurse will drop blood from the patient's vein typically at the back of the hand or inside the elbow. After inserting a sterile needle into the patient's vein, the technician will then draw the blood to fill one or more vials. A bandage is then wrapped around the blood draw site. The patient will likely experience a mild to moderate throbbing sensation at the wound site that may last a few minutes or hours. The doctor then sends the blood sample to the medical lab for testing, but receiving results could take up to a week or longer. After the blood draw, the patient may also experience a fainting sensation or feel lightheaded along with excessive bleeding or a hematoma that develops just under the skin. In rare cases, the patient will develop an infection where the needle was inserted. Never use imported dishware or store food in imported pottery because these products might contain lead. If any family member works in an occupation around lead-based products or materials, it is crucial that they change out of their work clothes including their shoes and socks before entering the house. Every piece of work clothing that could be contaminated with lead dust must be washed separately. We routinely review the Consumer Product Safety Commission website to identify any recalls for toys that might be in your home. No expecting mother or child should live in or visit any home built before 1978 while it is undergoing rehabilitation or renovation. Never allow the child to play in bare soil that might be contaminated with lead. Instead, provide sandboxes or plant grass over the soil or cover with woodchips. Never allow a cat to use the sandbox as a litter box because of the exposure to contaminated dust which could then be brought into the home. Never eat candy products that have been imported from Mexico because many of the sweet treats are manufactured in lead-based containers. Use cold water from the tap instead of hot water to drink, cook, or make baby formula. The hot water tank may contain lead or help bleach contaminated particles from the interior of a lead water pipe. Change your clothes in the shower after completing anything that involves lead-based products including making a bullet, producing stained-glass, or returning from a firing range. Since the 1980s, the US Government has removed lead from many products and industries including gasoline, water pipes, smokestack emissions, and solder. Make sure that you run water for at least a minute before using it, mop floors regularly and clean the walls and windows with soapy water to keep the dust down. Other ways to reduce your family's risk is to make sure your children wash their hands before meals, clean any toys that they come in regular contact with, and look for visible signs of damage such as peeling or cracked paint and damage to lead pipes or plumbing fixtures. When it is time to repair chipped paint or broken pipes, contact the health department to learn how to make the repairs safely and without kicking the lead dust into the air, where it can become more dangerous to you and your family. Make sure that only qualified lead abatement professionals handle the removal of lead-based materials or perform construction, rehabilitation, and remodeling projects in commercial residential buildings that were constructed before 1978. In 2015, the USDA (United States Department of Agriculture) published their Dietary Guidelines for Americans that contain detailed information on how to decrease lead absorption. The publication recommended eating a well-balanced diet of whole grains, fruits, vegetables, protein, and dairy products. A body supported by nutritious food makes it more challenging for lead to be absorbed. Feeding your family a diet rich in calcium, iron, and vitamin C. These supplements will help the body reject lead absorption and reduce the damage caused by lead poisoning. Calcium – High levels of calcium can ensure bones remain strong. Children and adults should have milk, cheese, and yogurt along with green, leafy vegetables and calcium-fortified foods including tofu, soy milk, and orange juice. Sardines and salmon are also rich and calcium. Iron – Normal levels of iron in the bloodstream help block the absorption of lead. These foods would include lean red meats, lintels, beans, dried fruit, pasta, bread, and iron-fortified cereal. Vitamin C – High levels of vitamin C help the body with lead. Adults and children should consume potatoes, peppers, tomatoes, grapefruit, oranges, melon, strawberries, and kiwis. The lead exposure injury attorneys at Rosenfeld Injury Lawyers LLC understand the serious harm your family members endured was not your fault but the result of someone else's negligence. We have successfully obtained millions on behalf of the victims and their family members to ensure they were adequately compensated to cover their medical expenses, household bills, lost wages, loss of future earnings, pain, suffering, and emotional damage and we can help your family too. Our legal team encourages you to contact our attorneys today to schedule a free, no-obligation case consultation to discuss the merits of your monetary recovery claim. We accept all personal injury cases, wrongful death lawsuits, and lead-based product injury claims through contingency fee arrangements. This legal contract postpones the payment of legal services until after we have successfully completed your case through a negotiated settlement or a jury verdict.